Who Says F1 is Confusing? Today there were a few changes around the ownership of the Lotus F1 team, because of the way that names have been changing lately we should take a look at some of it for fun! Lotus F1 used to be the Renault F1 team. It has no relation to the original Team Lotus that Colin Chapman ran, but still uses Renault engines. There was a revival of the Team Lotus name after Tony Fernandes bought the rights to the name from James Hunt's brother. 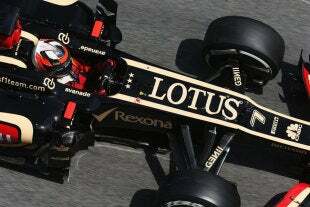 The Lotus F1 team sued over the name but lost. The team changed it's name to Caterham though after purchasing the maker of Lotus-7 clone cars and the Chapman family protested the re-entry of the Team Lotus name into F1. Now Genii Capital, the Luxembourg firm that owns most of the French-engined, British-named Lotus F1 has sold 35% of the team to Infinity Racing. This Infinity Racing isn't related to the Infiniti that is the title sponsor of the Infiniti-Red Bull Racing team. The Infiniti-Red Bull Racing team doesn't use Infiniti engines, but rather runs Renault power plants. Renault of course owns 44.3% of Nissan, which in turn owns Infiniti. Just for fun, Daimler, who owns the Mercedes F1 team also owns 3.9% or Renault.